The Royal Australian Mint, located in Canberra, is a prescribed agency within the Commonwealth Government portfolio of the Treasury. The Mint has been operating since 1965 and is the sole supplier of Australia’s circulating coinage. 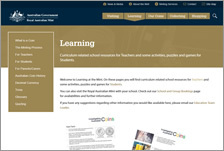 Following is the Royal Australian Mint education material posted on FTfs. Explores Australian coins, their value and how they are made. Facts for students, a unit of work, extra cross-curricular lesson ideas, student activity sheets and extra resources including a ‘Titan Heavy Lifter’ video.